How much do Adobe Photoshop and Illustrator cost? 52. Why did my Adobe licenses stop working? See also: What is my computer name in Windows? 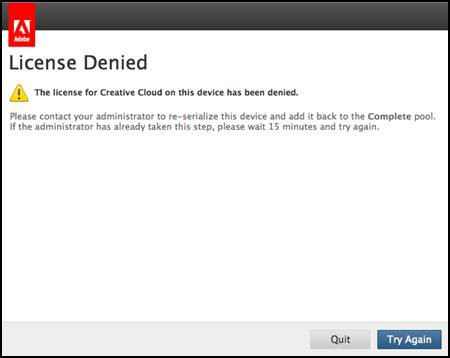 When the licensing do not work on Adobe software the computer will print the message License denied on this computer. You got a new computer with a new name but the old computer and name is still in the register. The computer got multiple names and one is in the register and one is in the license server. If you have logged into Adobe Creative Cloud then the licenses you are using in the cloud are being used and not the Uppsala University licenses. The software will then be unlicensed. Send the computer name to helpdesk@bmc.uu.se and what software you are using that is causing the problem. We will check the license register to make sure the license register contain the correct computer name. We have to manually run a special program for relicensing the already installed software on the computer. This can be done via remote control, via bringing the computer to BMC-IT or maybe someone have to out to the computer. The software will then start to work again. Perhaps there will be a period of waiting until the license department has reactivated the computer. Do not log into Adobe Creative Cloud.